Join Conflict Kitchen for a day-long series of free, public workshops highlighting traditional and contemporary uses of Iroquois White Corn. Ronnie Reitter (Seneca Nation, Wolf Clan) and Lauren Jimerson (Seneca Nation, Heron Clan) will lead informal lessons in hulling and washing heirloom corn, preparing Iroquois White Corn soup and contemporary Haudenosaunee recipes, and fashioning corn husk dolls. All workshops are free and open to the public. Iroquois White Corn hulling and washing workshop, led by Lauren Jimerson, IWCP manager. Open to public to participate throughout the day. Corn husk doll presentation and workshop, led by Ronnie Reitter. Open to first 15 members of public to participate. Vegan pumpkin chili cooking demonstration, led by Lauren Jimerson. Open to public to view and taste. Dinner hour discussion and informal presentations by Ronnie and Lauren about topics ranging from life on the reservation to food sovereignty, followed by Q & A. Guests are encouraged to purchase dinner at Conflict Kitchen prior to the discussion. The Iroquois White Corn Project is an “agri-cultural” organization housed at the Ganondagan State Historic Site in Victor, New York. 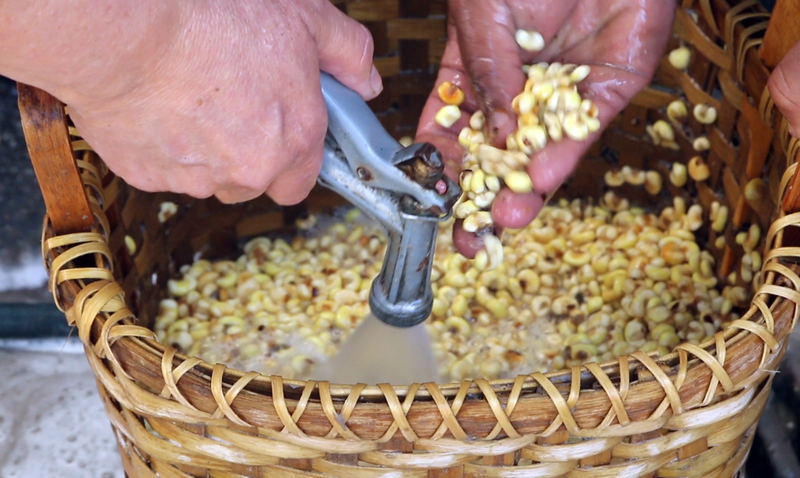 The IWCP grows, processes and sells heirloom white corn to promote food sovereignty, preserve traditions and foster healthy minds and bodies in Haudenosaunee communities. Lauren Jimerson (Seneca Nation, Heron Clan) grew up on the Cattaraugus Indian Reservation, south of Buffalo, NY. She is a fine artist and art therapist and utilizes her passion for cooking and nutrition in her job as the Interim Project Manager for the Iroquois White Corn Project at Ganondagan. Lauren believes that incorporating indigenous foods into a contemporary diet provides a link to a more traditional Haudenosaunee way of life, providing a healing journey in recovery from historical trauma. She has spent the last 18 years in Rochester, NY raising her children, Angel and Kalen, acclimating to her ancestral lands and making art. Ronnie Reitter (Seneca Nation, Wolf Clan) is from the Cattaruagus Territory in Western New York. She specializes in Haudenosaunee regalia and cornhusk work and is an accomplished storyteller. In her journey to discover her roots, she became deeply involved with learning and teaching Haudenosaunee traditional arts. As Park Supervisor of Ganondagan State Historic Site, Ronnie has been able to observe and learn from the many traditional artists who visit Ganondagan.